JS&M Sales and Marketing unconditionally guarantees your Weighted Hands to give you a life time of satisfaction or we’ll replace it. This is one reason Weighted Hands are the next big thing in fitness. * All older model heavy hands weights WILL fit and twist on to our Ergonomic grips. * $12 First Class Priority Mail shipping on all order within the United States up to 69LBS. There are thousands of fitness items on the market for exercise and weight loss. But only one out of every 1,200 is a fantastic value. 2. 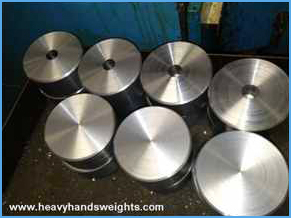 Weighted Hands are the only aerobically designed hand weight system with reinforced steel treads. Fifty men together couldn’t pull the weights apart. 3. A “GLOVE”- shaped grip lets you work longer without hand discomfort, calluses or blisters. 4. 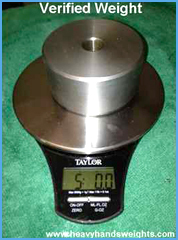 The weight face is precesion machined and beveled to look cool. 5. The steel was drop-forged for enormous strength. A jet aircraft’s landing gear is drop-forged for the same reason. 6. The cylindrical steel grip bar can withstand twenty-eight ton’s of force. 7. A patented pending grip assembly is designed to absorbs shock and reduce force. 8. The handle is textured to enhance grip and is resistant to perspiration, oil and grease. If you buy them, you’ll never have to buy another set unless you lose them. 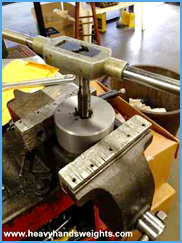 Below are photos at our Southern California plant where the first Weighted Hands were made. 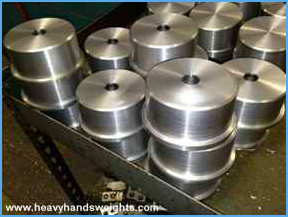 Here’s a stack of cut and partially machined five pound Weighted Hands twist on weights. 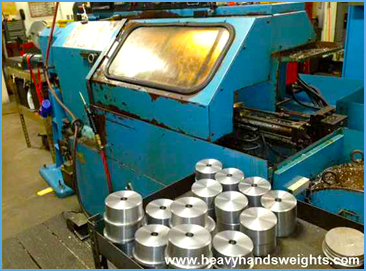 Machining Weighted Hands takes a lot more than raw material. You’ve got freight cost, fule, cutting the bar stock cost, tools, dies, drilling cost and more. There’s labor to man the machines and change out the parts. You have machining time, buffing, polishing, cleaning, boxing, packing, listing fees and shipping. 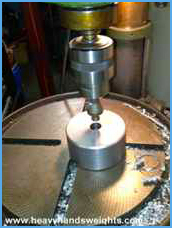 You are looking at the measurements on a Fanuc high production CNC lathe-mill. These machines are incredibly accurate. They can measure the thickness to the one thousandth of an inch. We use a chamfer bit to create a uniform chamfer on the inside edge of all our weights to add character, while retaining a crisp geometric line. You won’t see it once it’s on your Heavyhands handle, but your know it’s there. It’s just an extra design element that we feel is important and once that you’ll grow to appreciate. Here’s where we tap the part to give it the proper thread. This is the hole you’ll screw your AMF Heavyhands handles onto. You are ensured a nice tight fit that goes in perfect each time you take your weights off or onto the handles. 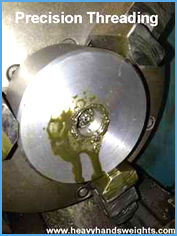 We made sure to clean the hole thoroughly by blowing out the chips from the drilling process. 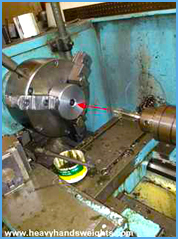 Any chips in the hole may cause the tap to snag while we’re creating the threads. 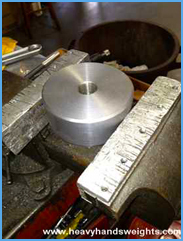 By clearing the hole, we ensure your threads are cut properly during the tapping process. 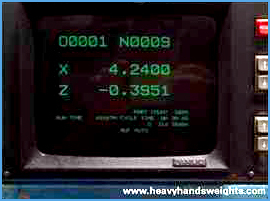 Each Weight Hands add on Weight is weighed so you can calculate the workloads and kilo calories you are burning during a Heavyhands workout. * $12 First Class Priority Mail shipping on all order within the United States up to 69 LBS.